The Heat Treater of Choice! Rex Heat Treat has a 75 year history of partnering with clients, gaining insight into their future needs, and helping them reach and surpass their goals. Rex Heat Treat began in a two car garage in Lansdale, Pennsylvania. 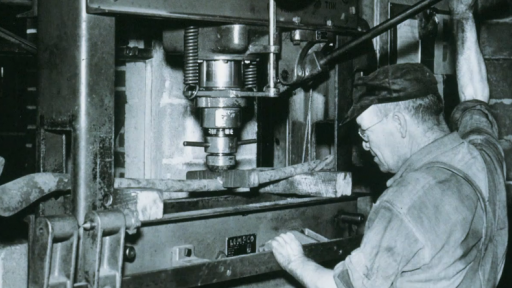 With the country entering World War II, the business grew rapidly due to the high demand of heat treating services for aircraft, guns, and various hand tools. After the war, J. Walter Rex and his partner Elmer Erb parted ways and the company became the J.W. Rex Company. In addition to the needs of peacetime products, there was a growing need for advanced military projectiles. J. W. Rex Company became recognized as a major resource for heat treating and, eventually, manufacturing of military ordnance shells for the Army and Navy. The business expanded again during the Korean War with increased manufacturing of ordnance components. In the late 1950’s, after a series of expansions at the original 3rd Street site, fifteen acres were purchased five blocks away. Construction began in 1958 with the goal of consolidating the various businesses in one large building. An anodizing facility was built first with 26-foot long tanks. At the same time, an automated paint shop was built to handle the painting of the ordnance product manufactured by Rex. The last section to be added to the new building project was the heat treating division. Remaining active in the defense technology, a need was identified to heat treat rocket motor cases. Thus, a unique and specialized 20-foot vertical gantry furnace system was built to heat treat Minuteman and Polaris missiles. This system utilized salt quench technology to minimize distortion. The very first Minuteman solid propellant three stages came together at the Rex facility in the late 1950’s. At the same time, commercial and ordnance heat treating capabilities were added to the facility. In the early 1960’s, anticipating the need for even larger missile systems, a 10 foot diameter by 30 foot high vertical gantry furnace was built along with salt and tempering capabilities. Titan missile cases were heat treated for Curtiss Wright and Westinghouse. Unique tempering fixtures were designed to maintain ovality. In the mid-1960’s, manufacturing capability was developed to shear spin missile cases. In the late 1960’s, with declining availability of missile type business, the Company developed tooling to process Chinook Helicopter spars measuring 30 feet long for Vertol in Philadelphia. In 1973, John W. Rex, son of J. Walter Rex, took over the operation of the facilities and identified a changing marketplace and the need to modify the focus of the business. The painting and anodizing divisions were closed to allow the business focus on heat treating. By now the building had expanded to 90,000 square feet of area and a major equipment expansion allowed the business to move into the growing commercial market of the area. The business continued to process military and aircraft parts and adapted the high quality requirements of those industries to the commercial work. The business was reorganized to be a quality leader. In 1980, Boeing contracted with Rex to heat treat hydrofoil foils and struts for a high-speed boat they were developing. Processing the large stainless steel products at 1900ºF and maintaining dimensional stability offered new challenges. After processing many of these parts, the Company was recognized by Boeing and the Small Business Administration as the 1981 “National Small Business Subcontractor of the Year”. Rex is the only commercial heat treater to have ever earned this distinction. In the late 1970’s, the business expanded with divisions in Conyers, Georgia, Orlando and Fort Lauderdale, Florida. In 1985 these businesses were sold to concentrate on the expanding business in Lansdale. During the late 1980’s and through the 1990’s, the business continued to expand and modify capabilities, adjusting to the ever-changing marketplace. The business is the largest commercial heat treat location in the Northeast United States. In 1999 the Company changed its name to Rex Heat Treat - Lansdale, and in January 2000, the business expanded with the building of a 30,000 square foot facility in Bedford, Pennsylvania. Rex Heat Treat - Bedford was far enough geographically from Lansdale to develop new markets in an area with excellent transportation access. The facility was equipped with new batch oil, polymer and salt quench heat treating capabilities. Continuous oil quench capability was also added. In 2005 the Company expanded again into Anniston, Alabama, with the acquisition of an existing 25,000 square foot commercial heat treating facility, but consolidated operations to provide specialized salt quenching heat treating capabilities. Rex Heat Treat - Alabama is about 90 miles west of Atlanta and services a variety of foundry operations producing austempered ductile iron. With the addition of Johnathan Rex, a third generation Rex, the business continues to identify and seek opportunities in the commercial heat treating market that allows for expansion of unique process capabilities and offers special quality services.